For a young boy growing up in Guatemala City, the “American Dream” probably felt like just that, a faraway dream. 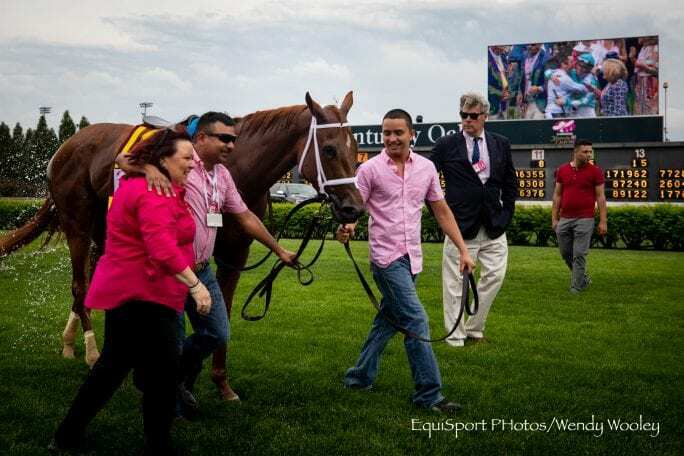 On Saturday, however, Darwin Aguilar watched his charge Monomoy Girl run into the history books in the Breeders’ Cup Distaff and found himself in awe at the path his life had taken. “I never imagined taking care of a horse like her,” Aguilar said, smiling shyly at me from across the room in trainer Brad Cox’s office. The 23-year-old speaks enough English to get by in the barn, but he’s a bit nervous to be interviewed and seems more comfortable with his native Spanish as I ask him about Guatemala and how he came to care for the likely Eclipse Award winner. Life in Guatemala wasn’t easy for Aguilar. The only job he could get was on a big dairy farm, working 15 days on and one day off with hours from sun up to sun down. He’d ridden horses around with his friends now and again but had a lot more experience with the fat, moody dairy cows than with anything resembling a Thoroughbred racehorse. Of course he wanted to come to America, he said; everybody in Guatemala does. That’s the dream. Aguilar’s goal, like that of most of his friends, is to save up as much as he can and eventually return home to buy a nice house for his family with some land, and maybe even a car. He came to the United States five years ago and initially spent three months as a hotwalker for trainer Ronny Werner. A spot for a groom opened up in the Werner barn, and Aguilar spent another year learning those skills on the fly from his co-workers. For the past four years — a lifetime on the racetrack — Aguilar has worked for trainer Brad Cox. His two sisters now work with him as well, both as hotwalkers, while he is responsible for the daily care of five horses. Monomoy Girl has been his leading lady for eight months now, since before she won the Ashland Stakes at Keeneland. Aguilar wasn’t there that day, but he did get to lead her into the paddock before the Kentucky Oaks. He was amazed at all the people in the grandstand on Oaks Day and couldn’t contain his joy when she dug in to cross the wire a half-length ahead of Wonder Gadot. The resulting inquiry tempered his emotion a bit, but when Monomoy Girl was crowned with the garland of lilies, Aguilar was right there at her side. The filly stayed in his care at Churchill Downs through most of the season, and Aguilar explained how she could be a little bit temperamental in her stall. Aguilar cupped his hands to show me how many mints he’d given the filly after her Breeders’ Cup win, about the size of a grapefruit. “Outside the stall, she is perfect,” Aguilar continued. “And in the paddock, she’s very professional, never gets upset and stays relaxed. “But I was nervous! I didn’t know if she’d run straight or if she’d do it again,” he said, making a zig-zag motion with his hands. In her Breeders’ Cup prep, the Grade 1 Cotillion at Parx, Monomoy Girl crossed the wire first ahead of Midnight Bisou but was eventually taken down by the stewards, disqualified for interference in the stretch run. Much to Aguilar’s relief, she demonstrated no such theatrics in the Breeders’ Cup, flying straight down the lane to win by a length. Aguilar grins at the memory, then takes me out into the shed row to show me how clean and organized his space is. He’s immensely proud of the work he does, and it shows, but he isn’t prideful; he was as quick to tell me he was nervous as he was to remember how he felt in the winner’s circle. The young groom isn’t sure about his plans for the future: he said he doesn’t have any big aspirations other than to eventually return home to Guatemala. Of course, he’s not leaving anytime soon, not while Monomoy Girl is still in the barn. The post Breeders’ Cup Presents Connections: Aguilar ‘Never Imagined’ He’d Groom A Champion appeared first on Horse Racing News | Paulick Report.